TRACES is a ten projector site specific installation spanning two connected rooms. Images projected on back walls of both galleries are excerpts from an eight minute repeating sequence. The images fill the entire walls. 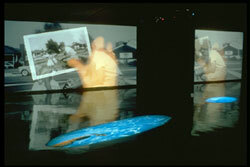 In the projected pools on the floor, images of a woman swimmer are continuously dissolving into each other so it appears that she is constantly swimming laps. In the far corner of the second gallery, a hand turns pages of three family photo albums in a twenty minute repeating sequence. 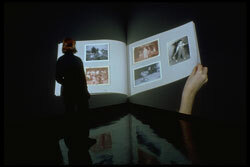 Back Wall Sequences: The rooms are divided by a half wall, making it possible to view both back walls of the galleries simultaneously. In the left room, family images slowly dissolve into each other. In the right room, some of the same family images appear, but are rearranged and intercut with significant media images from the last fifty years (such as the Kennedy assassinations, Civil Right's marches, Vietnam, the Holocaust.) The pacing is faster. The sequences begin with the same images, continually play off one another, and then come together again at the end. A sound lop of rippling water plays continuously. TRACES was commissioned by the University Art Museum at California State University, Long Beach and exhibited there as Centric 42, January-March 1991 and at the Museum of Contemporary Art in Chicago, IL as Options 43, December 1991 to January 1992.